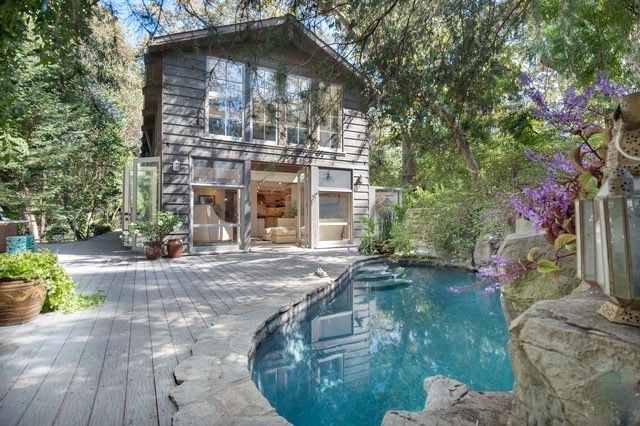 Nestled in the heart of Rustic Canyon, this private creek side retreat exudes unique character and charm. Indoor/outdoor living seamlessly flows between the living room and large deck with heated pool, mature trees and foliage. The open kitchen features Viking appliances, butcher block countertops and a granite center island. A large private upper master suite offers abundant natural light, sitting area, large walk-in closet and serene bathroom with a soaking tub & separate shower. This home was designed with a pristine attention to detail including Jerusalem stone and plank wood floors, European hardware, skylights and high ceilings throughout. This romantic retreat is the perfect place to relax and unwind.